I have accumulated quite of few of the Folkart, inexpensive, 12" x 12" paper stencil packs. I decided to try and make a collage rather than individual 12" x 12" Valentine's Day signs. I found this Mastercraft Edge Glued Pine Board, 1" x 12" x 4' at my local Menards. It was $7.99, and needed no sawing and no sanding! Sometimes worth a little extra. I laid my ruler along the side of the board and taped it off with Frog Tape Multi-Surface Painting Tape , every 12 inches. ****Important - the tape now divides the boards into fourths, but since the tape is .94" wide, you need to take the width of the tape into consideration when painting your board. 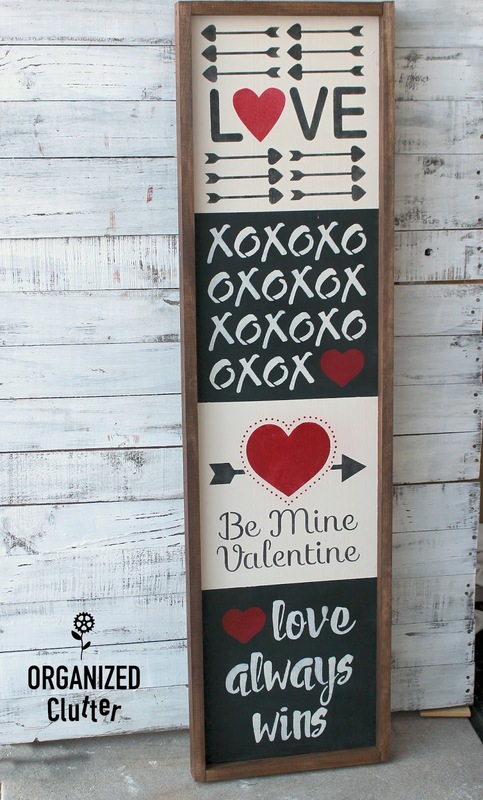 I painted the second and fourth square with Dixie Belle Chalk Finish Paint in CAVIAR . To compensate for the width the of tape, I taped another row of Frog Tape directly to the right of the tape that divided the board into fourths. I just love how crisp the paint lines come out with Frog Tape, and how few brush strokes I get with my new Zibra Grip-n-Glide 2-Inch Paint Brush with a Stubby Handle . Two of the taped off areas were painted with Dixie Belle Chalk Finish Paint in Drop Cloth . 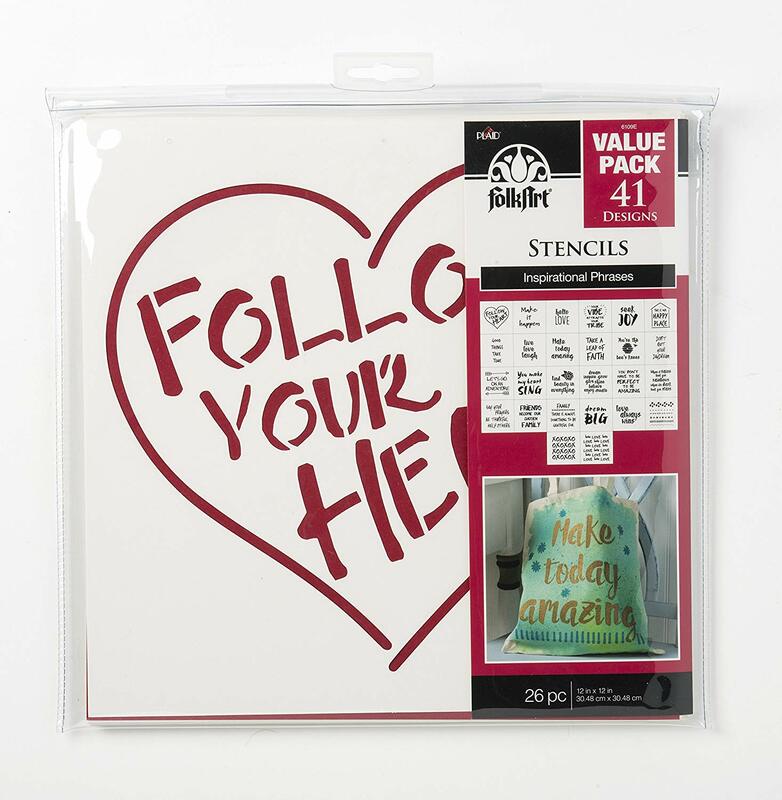 I chose four Folkart 12" x 12" paper stencils, from two different packs, for my Valentine's Day collage sign. 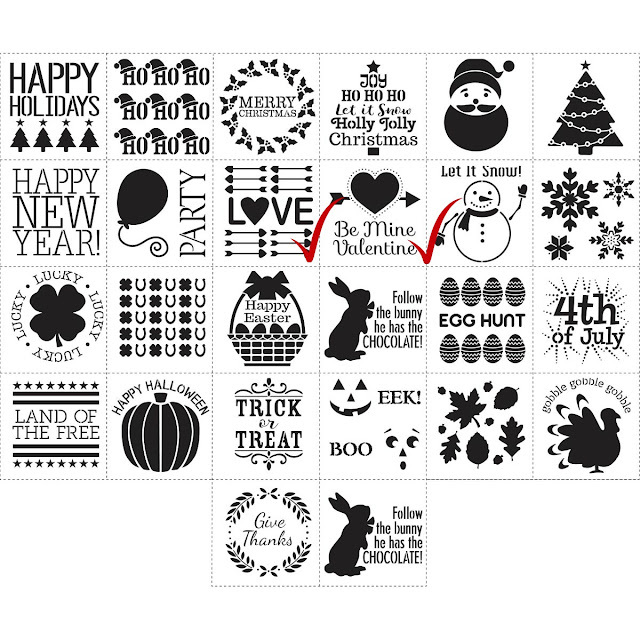 Folkart paper stencil packs have to be punched or pressed out along the perforations. Two of the Valentine's day sign stencils were included in the FolkArt Holiday Value Stencil Pack . I have used this pack a lot. 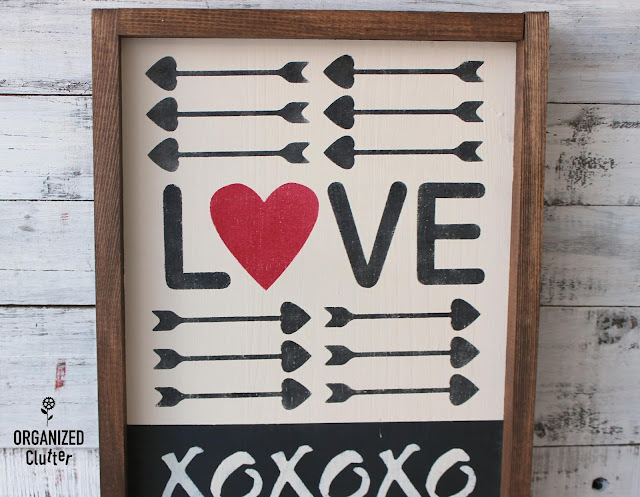 "Love with Arrows" and "Be Mine Valentine" were chosen from the holiday pack. 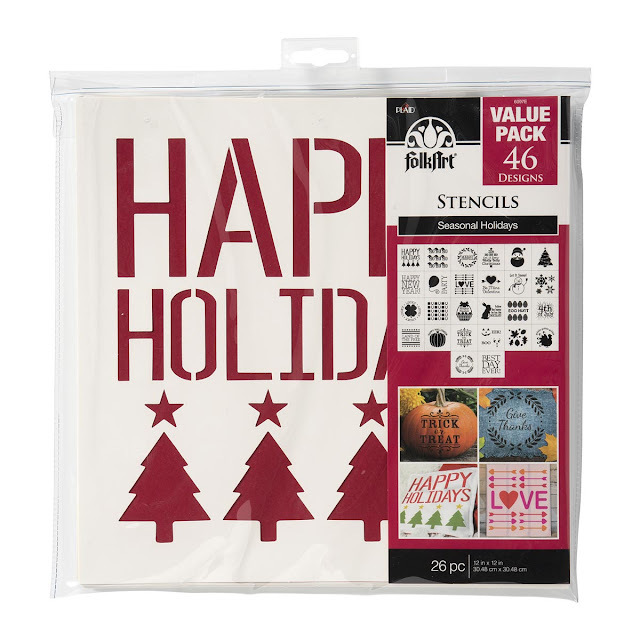 And two of the collage stencils were from the FolkArt Value Pack-Inspiration Stencils. 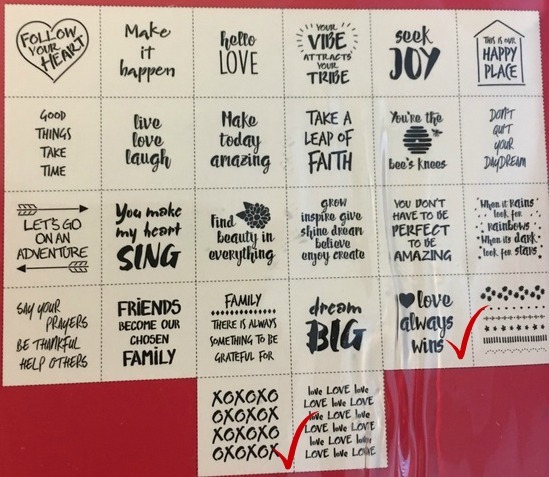 I chose "Love Always Wins" and the "XOXO" stencils from this pack. 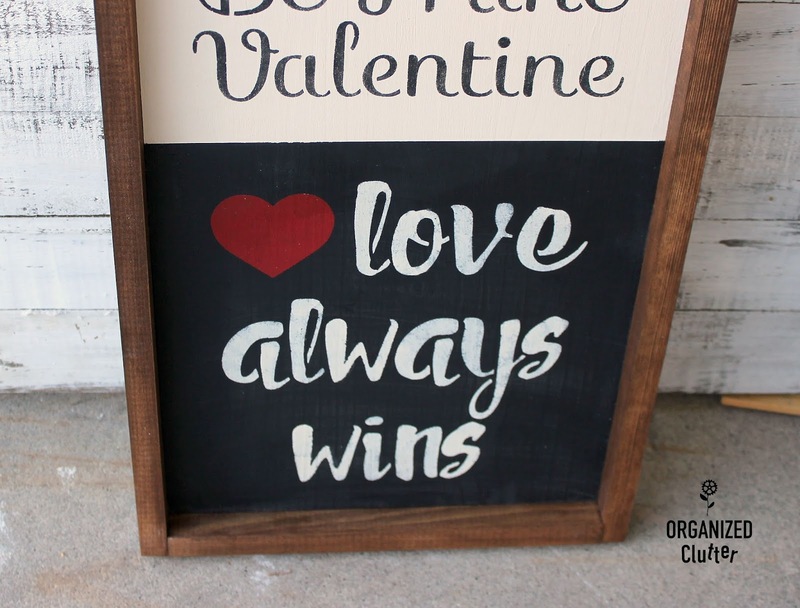 I used the heart stencil from "Love Always Wins" in place of the last O and X. 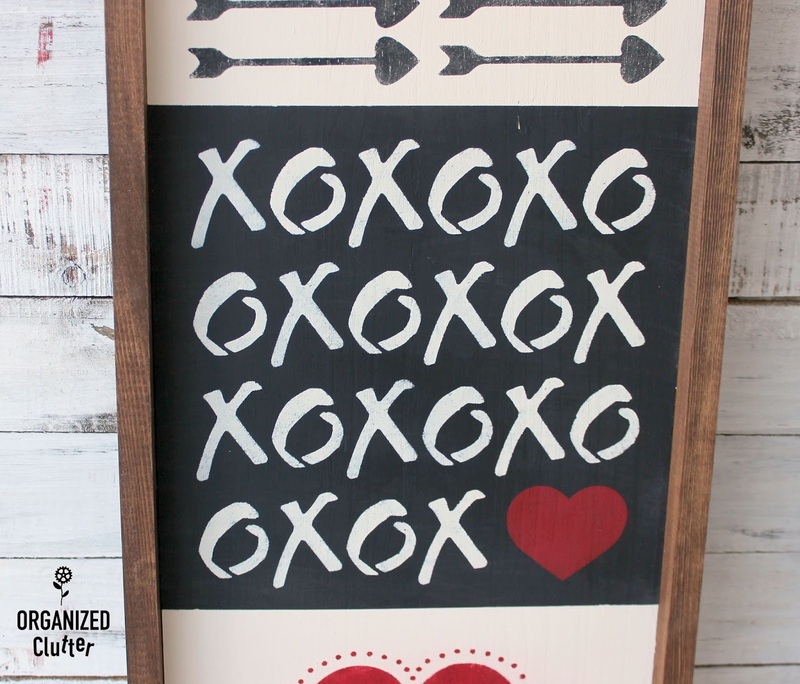 For stenciling, I used Dixie Belle Paint in Caviar for my black stenciling, and DecoArt Chalky Finish Paint in Rouge for the red hearts. So here are the four signs that make up my collage. I am so glad that I replaced the last O and X with a red heart! Now all four signs have a red heart! The third sign down from the top on the collage sign! 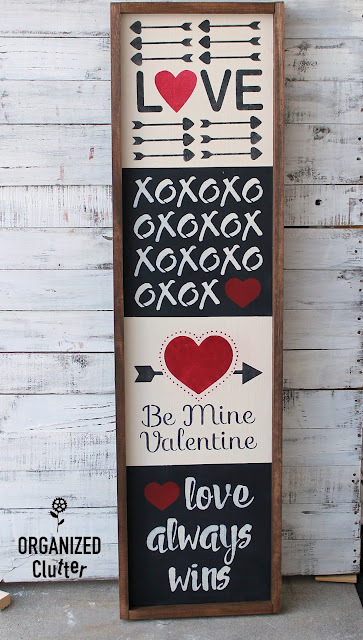 The only sign to contain the word "Valentine". I sure hope "Love" always wins! The last sign in the collage. 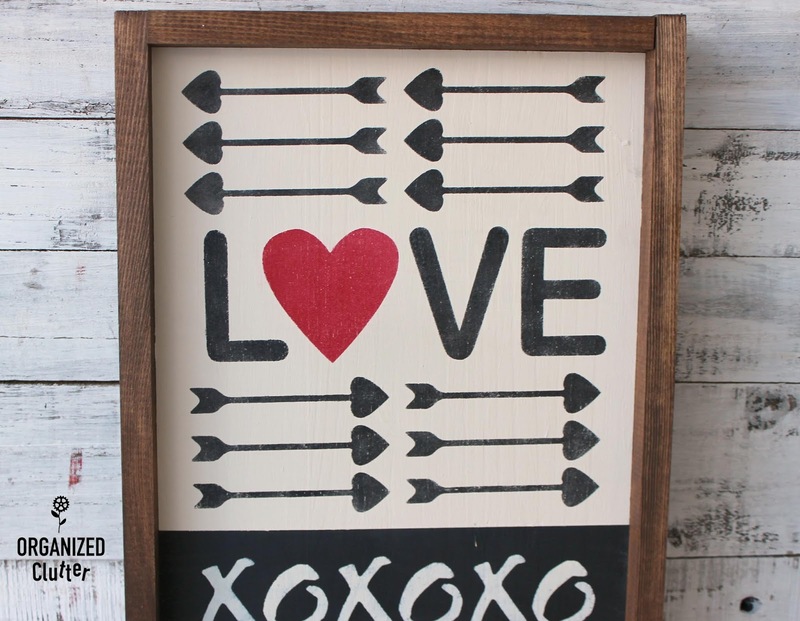 This is the very first sign that I stenciled that has a homemade frame. I usually cheat, and stencil the cardboard that came with the thrifted frame, or a piece of bead board that fits the frame. I like the look of the "stained skinny boards" around the signs nowadays. I enlisted my husband's help to get this done. He purchased 1" x 2" x 8' furring strips from Menards. The boards on the sides were cut at roughly 50" and the top and bottom boards were cut to 12". I used Varathane Wood Stain in Dark Walnut to stain the frame boards. 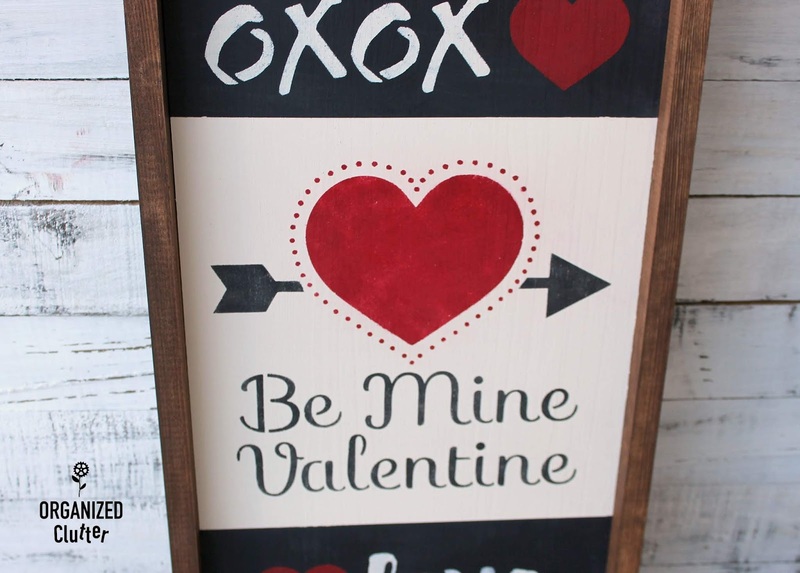 I did not poly or wax the frame boards, but I did wax the sign with Dixie Belle Best Dang Wax in Clear . My husband used screws to attach the furring strips to the sign, and to the horizontal frame boards. It may have been overkill. I think nails may have done the trick, but who am I to argue with free help? A sawtooth hanger was added to the back for hanging, but the sign can lean up against a wall too. If you are going to expose a sign to the elements outside, use several coats of poly or urethane to seal it. Anybody can be a sign maker!